This article was originally posted on skymann.net in 2016. It is presented here without editing or modification from the version which was published. Halal certification is the practise of inspecting food items to make sure that they fit within the Islamic dietary requirements, usually resulting in a sticker featuring the phrase Halal in Arabic script (حلال) . This practice is completely voluntary on the part of the food corporations sending their products to these clearing-houses and completely outrageous to the far right. 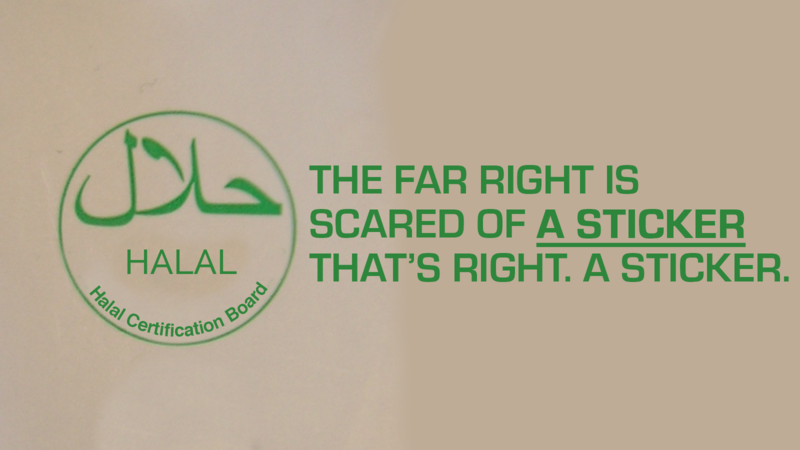 It gets more ridiculous when you consider that these anti-Islamic groups are scared that a sticker is funding groups like IS. One Nation claims that the sticker is a religious “surcharge”, referring to the fact that clearing-houses charge companies for their services. Nestle, one of the many companies who apply for third-party Halal certification and owners of the true-blue Australian drink powder Milo, disputes this claim saying that that they “don’t add this cost [of certification] on to the recommended retail price” (although Nestle doesn’t put Halal stickers on their products). Not to drag other groups through the mud but why aren’t these anti “religious tax” people protesting Kosher, the Jewish equivalent of Halal which has many of the same restrictions. I don’t condone Anti-Jewish sentiment but if you’re going to protest fictitious Islamic surcharges then shouldn’t you protest other religions’ nonexistent surcharges: be consistent with your insane ideology. One Kosher certifier, the Kashrut Authority charges “between $500 and $2200” for domestic certification, which for companies like Arnott’s is a drop in the bucket. It seems that the reason that these “patriotic” groups don’t protest Kosher certification is because it’s not Islamic. In short, Halal certification doesn’t fund terrorism, doesn’t cost consumers anything and isn’t the only religious certification. The only people who believe this are far-right crazies who are scared of stickers with foreign calligraphy on them. Not to mention the previously mentioned religious certifications that aren’t protested even though most of the arguments one could make against Halal certification could also be made against them. The article image is a modified version of an image licensed under CC-BY-SA from Tomchiukc on Wikimedia Commons. You can use the article image provided you credit both Tomchiukc and iosef.org and if you make modification to the image, you must also release it under the CC-BY-SA licence.